UK wine importer and retailer Wine Sensations carries some of the most fascinating artisan wines available in the UK, with a bias towards organic and biodynamic wines. With their own warehouse, they cut out the usual chain of importers and wholesalers, which gives them the ability to import very small-production wines, and offer them direct to the public. I’ve been hugely impressed by a number of their wines, and took the time to visit their stand at the most recent London wine trade fair. Helping to man their stand was the gregarious and enthusiastic Hartmut Heinz (right), the current generation in charge of Weingut im Zwölberich, whose wines Wine Sensations has recently begun to import. The Zwölberich vineyards cover 21 hectares in the Nahe, a small wine growing area that is part of Germany’s Rhineland-Palatinate region. Producing around 250,000 bottles annualy, the certified organic and biodynamic estate has been farmed biodynamically for over 20 years (though the family estate actually dates back to 1711). Hartmut’s motto is “Hand in hand with nature,” and it’s a philosophy he so clearly holds dear, with great biodiversity encouraged in the vineyards and minimal use of any treatments. Sixteen different grape varieties are cultivated in an unusually diverse German estate, exploiting the range of sites and soils from gravel, to sand, to clay. Some of the production of individual wines is tiny, and indeed all bottles are individually numbered. Small oak barrels are used for fermenting and maturing some cuvées, as are large, old oak casks. 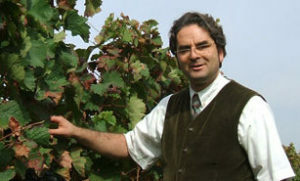 Owner and winemaker Hartmut Heinz was instrumental in elevating the Auxerrois variety to Qualitätswein status in Germany. Auxerrois is grown widely in Alsace and in Luxembourg, and is a grape that is capable of the highest quality, but only with very careful cultivation and handling to ensure small yields and concentration of aroma and flavour. Two example were tasted here, both excellent, but the late-harvested old vines example is just an extraordinary and outstanding white wine, and shows the true potential of the variety, justifying Hartmut’s faith in it. Wine Sensations is the UK importer of the wines. At the moment not every wine reviewed here is in the UK, but all will be shipped so please do contact Wine Sensations if interested via help@winesensations.co.uk. (2016) A Riesling of Spätlese quality, made as a sparkling Sekt, this has a delightfully clean and fresh, leafy and herbal nose, and plenty of streaming, tiny bubbles. With 8g/l of dosage it is a properly dry Brut, tight, long and lemony, the crisp mousse giving it a pleasurable wave of flavour that rolls across the tongue to the finish. (2016) It was a 10 year battle for Hartmut to have Auxerrois from the Nahe recognised as an official quality wine, and with this and the stunning late-harvest cuvée he stands totally vindicated. A lovely fresh herb and apple nose, just a touch of mid-palate peach sweetness, but then a really pithy, apple core and mineral dryness that gives this such a long, shimmering finish. 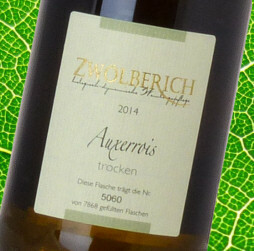 (2016) Fabulous stuff, this old vine Auxerrois from Zwölberich pours a pale golden yellow colour and the aromas sing from the glass, ripe yellow apples, blossom, nougat and almond, so inviting. On the palate it is luscious and quite full, the sheerness and sweetness of the fruit is intense, nuttiness from some barrel ageing I suspect, and a long, pin-sharp finish with glittering acidity. Just a fabulous wine. For sale direct from Zwölberich at 29€ per bottle. (2016) A special selection of the very best Riesling from the Löhrer Berg vineyards, Hartmut says its a great example of how to learn to work with nature: "Stay on the wave, not against it." Vinified with natural yeasts, as are all these certified biodynamic wines, it has a lovely suggestion of ripeness and richness, a touch of late-harvest exoticism (though only 3g/l of residual sugar), the juiciness of fesh cut apples and delightful length and acid focus. (2016) Another outstanding sweet Riesling from Zwölberich's biodynamic Langenlonsheim Königsschild vineyard, with 70.7g/l of residual sugar. Beautifully refined aromatics, with yellow plum and a hint of orange, delicate floral nuances well into the background. The palate is rich, honeyed and golden-hued, apricot and sweet, thick nectarine juice, but of course terrific balacing acidity, fat lemons and orange, and a long, sweet finish. 16.80€ direct from the winery. (2016) A fabulous late-harvest Riesling with 99.9g/l residual sugar from Zwölberich's biodynamic vineyards, this has a wonderfully waxy nose, deep citrus peel and nectarine scents, and hints of that paraffin-like minerality that's so appealing in this mix. In the mouth it is seductively sweet, but as always it is the acid juiciness that makes such a wine, the nectarine and peach juice sweetness sliced through with shimmering Mandarin orange fruity acidity into a long finish. Terrific, and 24.80€ from the winery. (2016) From a Pinot Noir vineyard planted in 1992, Hartmut says he'll be truly happy once it reaches its 40th or 50th birthday. Absolutely lovely nose, filled with creamy berries and a sweet vanilla, touched lightly by earth and chalk. Tight, fine tannins, from skins rather than oak, light and vibrant, but plushness and so easy to drink too. (2016) Though originally a Portuguese variety, today Portugeiser is a popular red wine grape in Germany and eastern Europe, and in this case, from a vineyard planted in the 1980s. Quite meaty, earthy and herbal, it then becomes much fresher and red-fruited, with raspberry freshness allied to a cracked river stone hint of minerality. Tannins are soft, and it's a highly quaffable and barbecue-friendly red. I have tried most of these wines – and enjoyed every one.